The world's bestselling Lean expert shows service-based organizations how to go Lean, gain value, and get results--The Toyota Way. 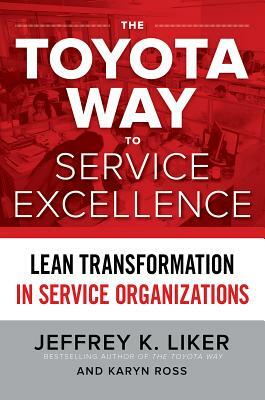 A must-read for service professionals of every level, this essential book takes the proven Lean principles of the bestselling Toyota Way series and applies them directly to the industries where quality of service is crucial for success. Jeff Liker and Karyn Ross show you how to develop Lean practices throughout your organization using the famous 4P model. Whether you are an executive, manager, consultant, or frontline worker who deals with customers every day, you'll learn how take advantage of all Lean has to offer. With this book as your guide, you'll gain a clear understanding of Lean and discover the principles, practices and tools needed to develop people and processes that surprise and delight each of your customers. These ground-tested techniques are designed to help you make continuous improvements in your services, streamline your operations, and add ever-increasing value to your customers. Fascinating case studies of Lean-driven success in a range of service industries, including healthcare, insurance, financial services, and telecommunications, illustrate that Lean principles and practices work as well in services as they do in manufacturing. Drawn from original research and real-world examples, The Toyota Way to Service Excellence will help you make the leap to Lean. Dr. Jeffrey K. Liker is Professor of Industrial and Operations Engineering at the University of Michigan and President of Liker Lean Advisors. He is author of the international best-seller, The Toyota Way: 14 Management Principles from the World's Greatest Manufacturer, 2004 (26 languages, over 900,000 copies sold), and has coauthored eight other books about Toyota including The Toyota Way to Lean Leadership (2011). His articles and books have won twelve Shingo Prizes for Research Excellence. In 2012 he was inducted into the Association of Manufacturing Excellence Hall of Fame and in 2016 inducted into the Shingo Academy. Liker lives in Ann Arbor, Michigan with his wife and children. Karyn Ross is a Lean consultant and executive coach focused on driving sustainable business culture change in service organizations. She has worked with companies such as Paychex, PrimePay, Zurich Insurance, and National Taxi Limo to help them develop a culture of problem solving and improved business practices. A regular contributor to the Lean Leadership Ways Industry Week Blog, she has also written for The Lean Management Journal and Industrial Engineer Magazine. Ross resides in Naperville, Illinois.